Vulnerability of soil separates to detachment by water is described as soil erodibility by Universal Soil Loss Equation which can be affected by land use change. 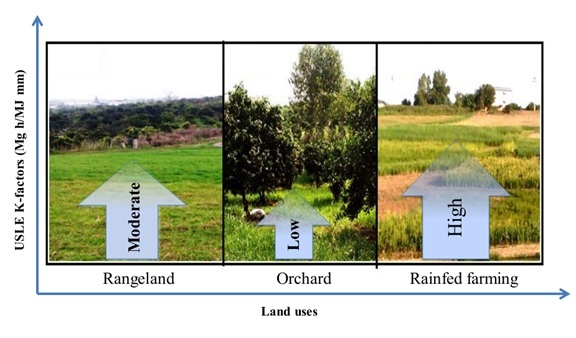 In this study it was attempted to quantify the changes of Universal Soil Loss Equation K-factor and its soil driving factors in three land uses including rangeland, rainfed farming, and orchards in Babolrood watershed, northern Iran. Soil composite samples were obtained from two layers in three land uses, and the related soil physico-chemical properties were measured. The rainfed farming land use showed the highest clay contents, but the highest amounts of soil organic matter and sand particles were found in orchard land use. The high intensity of tillage led to the significant decrease of soil aggregate stability and permeability in the rainfed farming land use. The Universal Soil Loss Equation K-factor was negatively correlated with soil permeability (r=-0.77**). In rangeland, the K-factor (0.045 Mg h/MJ/mm) was significantly higher and the particle size distribution had a great impact on the K-factor. The orchard land use, converted from the rangeland, did not show any increase of soils erodibility and can potentially be introduced as a good alternative land use in sloping areas. However, more detailed studies on environmental, social and economic aspects of this land use are needed. The USLE K-factor was negatively correlated with soil permeability. Afshar, F.A. ; Ayoubi, S.; Jalalian, A., (2010). Soil redistribution rate and its relationship with soil organic carbon and total nitrogen using 137 Cs technique in a cultivated complex hillslope in western Iran. J. Environ. Radioact., 101(8): 606-614 (9 pages). Bewket, W.; Stroosnijder, L., (2003). Effects of agroecological land use succession on soil properties in Chemoga watershed, Blue Nile basin, Ethiopia. Geoderma., 111(1): 85-98 (14 pages). Blake, G.R. ; Hartage, K.H., (1986). Bulk density, In: Klute, A., (Ed. ), Methods of Soil Analysis, Part 1, 2nd Edition. Agronomy Monograph. Vol. 9, Ameri. Soci. Agro., Madison., WI. 363-375 (13 pages). Borselli, L.; Cassi, P.; Salvador Sanchis, P., (2009). Soil erodibility assessment for applications at watershed scale. In: E.A.C. Constantini (Ed .). Manual of methods for soil and land. Science Publisher, NH: Inc, En field: Science Publisher, NH: Inc, Enfi eld. Chapter 5. 98-117 (20 pages). Bouyoucos, G.J., (1962). Hydrometer method improved for making particle size analyses of soils. Agro. J., 54(5): 464-465 (2 page). Cantón, Y.; Solé-Benet, A.; Asensio, C.; Chamizo, S.; Puigdefábregas, J., (2009). Aggregate stability in range sandy loam soils relationships with runoff and erosion. Catena., 77(3): 192-199 (8 pages). Celik, I., (2005). Land-use effects on organic matter and physical properties of soil in a southern Mediterranean highland of Turkey. Soil Tillage Res., (83): 270-277 (8 pages). Cerdà, A.; Morera, A.G.; Bodí, M.B., (2009). Soil and Water Losses from New Citrus Orchards Growing on Sloped Soils in the Western Mediterranean Basin. Earth Surf. Process. Landf., 34 (13): 1822-1830 (9 pages). Cerdà, A.; González-Pelayo, O.; Giménez-Morera, A.; Jordán, A.; Pereira, P.; Novara, A.; Brevik, E.C. ; Prosdocimi, M.; Mahmoodabadi, M.; Keesstra, S.; García Orenes, F.; Ritsema, C., (2016). The use of barley straw residues to avoid high erosion and runoff rates on persimmon plantations in Eastern Spain under low frequency – high magnitude simulated rainfall events. Soil Res., 54 (2): 154-165 (12 pages). Cerdà, A.; Keesstra, S.D. ; Rodrigo-Comino, J.; Novara, A.; Pereira, P.; Brevik, E., Giménez-Morera, A.; Fernández-Raga, M.; Pulido, M.; Di Prima, S.; Jordán, A. (2017). Runoff initiation, soil detachment and connectivity are enhanced as a consequence of vineyards plantations. J. Environ. Manage., 202: 268-275 (8 pages). Cerdà, A.; Rodrigo-Comino, J.; Giménez-Morera, A.; Keesstra, S.D., (2017). An economic, perception and biophysical approach to the use of oat straw as mulch in Mediterranean rainfed agriculture land. Ecol. Eng., 108: 162-171 (10 pages). Charman, P.E. ; Murphy, B.W., (2007). Soils: their properties and management: Oxford University Press, USA. Danielson, R.; Sutherland, P., (1986). Porosity. In A. Klute(ed.) Methods of soil analysis. Part 1. Agr. Monograph. Ameri. Soci. Agro. SSSA, Madison, WI. 9: 443-462 (20 pages). Devatha, C.P. ; Deshpande, V.; Renukaprasad, M.S., (2015). Estimation of soil loss using USLE model for Kulhan Watershed, Chattisgarh- A Case study. Aquat. procedia., 4:1429-1436 (8 pages). Duiker, S.W. ; Flangman, D.C.; Lal, R., (2001). Erodibility and Infiltration Characteristics of five Major Soils of South-West Spain. Catena., 45(2): 103-121 (19 pages). Emadi, M.; Emadi, M.; Baghernejad, M.; Fathi, H.; Saffari, M., (2008). Effect of land use change on selected soil physical and chemical properties in North Highlands of Iran. J. Applied. Sci., 8(3): 496-502 (7 pages). Emadi, M.; Baghernejad, M.; Memarian, H.R., (2009). Effect of land-use change on soil fertility characteristics within water-stable aggregates of two cultivated soils in northern Iran. Land Use Policy., 26: 452–457 (6 pages). Evrendilek, F.; Celik, I.; Kilic, S., (2004). Changes in soil organic carbon and other physical soil properties along adjacent Mediterranean forest, grassland, and cropland ecosystems in Turkey. J. Arid. Environ., 59(4), 743-752 (10 pages). Huang, T.C.C. ; Lo, K.F.A., (2015). Effects of Land Use Change on Sediment and Water Yields in Yang Ming Shan National Park, Taiwan. Environ., (2): 32-42 (11 pages). Hairiah, K.; Sulistyani, H.; Suprayogo, D.; Purnomosidhi, P.; Widodo, R. H.; Van Noordwijk, M., (2006). Litter layer residence time in forest and coffee agroforestry systems in Sumberjaya, West Lampung. For. Ecol. Manage., 224(1): 45-57 (13 pages). Karbassi, A.R. ; Pazoki, M., (2015). Environmental qualitative assessment of rivers sediments. Global J. Environ. Sci. Manage., 1(2): 109-116 (8 pages). Kemper, W.D. ; Rosenau, R.C., (1986). Aggregate stability and size distribution. In: Klute, A. (Ed. ), Methods of Soil Analysis. Part 1. Physical and Mineralogical Methods, second ed. Agro. Monographs., 9. ASA-SSA, Madison, WI, pp. 425–442 (18 pages). Keesstra, S.; Pereira, P.; Novara, A.; Brevik, E.C. ; Azorin-Molina, C.; Parras-Alcántara, L.; Jordán, A.; Cerdà, A., (2016). Effects of Soil Management Techniques on Soil Water Erosion in apricot Orchards. Sci. Total Environ., 551-552: 357-366 (10 pages). Khalilmoghadam, B.; Afyuni, M.; Abbaspour, K.; Jalalian, A.; Dehghani, A.; Schulin, R., (2009). Estimation of surface shear strength in Zagros region of Iran—A comparison of artificial neural networks and multiple-linear regression models. Geoderma., 153(1): 29-36 (8 pages). Kostiakov, A.N., (1932). On the dynamics of the coefficient of water-percolation in soils and on the necessity for studying it from a dynamic point of view for purposes of amelioration. Trans. 6th comm. Int. Soc. Soil Sci., Russia, Pt A, 6: 17-21 (5 pages). Lal, R., (1988). Erodibility and erosivity. Soil. Ero. Res. Methods., 141-160 (20 pages). Lambin, E.F.; Geist, H.J., (2008). Land-use and land-cover change: local processes and global impacts. Sci. Business Media., 1-8 (8 pages). Larsson, M.; Eliasson, S., (2006). The influence of land-use change, root abundance and macropores on saturated infiltration rate-a field study on Western Java, Indonesia., 1-58 (58 pages). Le Bissonnais, Y., (2005). Aggregate breakdown mechanisms and erodibility. In R. Lal ed. Encyclopedia of Soil Science, 2nd ed. The Ohio State University, Columbus, OH. Lemenih, M.; Karltun, E.; Olsson, M., (2005). Assessing soil chemical and physical property responses to deforestation and subsequent cultivation in smallholders farming system in Ethiopia. Agri. Eco. Environ., 105(1): 373-386 (14 pages). Martinez-Mena, M.; Lopez, J.; Almagro, M.; Boix-Fayos, C.; Albaladejo, J., (2008). Effect of water erosion and cultivation on the soil carbon stock in a semiarid area of South-East Spain. Soil Tillage Res., 99(1): 119-129 (11 pages). Mol, G.; Keesstra, S.D., (2012). Soil science in achanging world. Current Opinions Environ. Sustainability., 4: 473–477 (5 pages). Morgan, R.P.C., (2004). Soil erosion and conservation. Soil. Sci., 145(6): 461 (1 page). Novara, A.; Keesstra, S.; Cerdà, A.; Pereira, P.; Gristina, L., (2016). Understanding the role of soil erosion on co2-c loss using 13c isotopic signatures in abandoned Mediterranean agricultural land. Sci. Total Environ., 550: 330-336 (7 pages). Ostovari, Y.; Asgari, K.; Cornelis, W.; Beigi-Harchegani, H., (2015). Simple methods for estimating field capacity using Mamdani inference system and regression tree. Arch. Agron. Soil Sci., 61(6): 851-864 (14 pages). Ostovari, Y.; Ghorbani-Dashtaki, S.; Bahrami, H.A. ; Naderi, M.; Dematte, J.A.M. ; Kerry, R., (2016). Modification of the USLE K factor for soil erodibility assessment on calcareous soils in Iran. Geomorphology., 273: 385-395 (11 pages). Panagos, P.; Meusburger, K.; Alewell, C.; Montanarella, L., (2012). Soil erodibility estimation using LUCAS point survey data of Europe. Environ. Model. Software, 30: 143-145 (3 pages). Parlange J.Y. ; Haverkamp R., (1989). Infiltration and ponding time. In: Unsaturated flow in hydrologic modeling theory and practice (Morel-Seytoux H J, ed),. Kluwer Academic Publishers, Boston, MA. 37: 95–126 (32 pages). Parras-Alcántara, L.; Lozano-García, B.; Keesstra, S.; Cerdà, A.; Brevik, E.C., (2016). Long-term effects of soil management on ecosystem services and soil loss estimation in olive grove top soils. Sci. Total Environ., 571: 498-506 (9 pages). Philip J.R., (1969). Theory of Infiltration. Academic Press, New York., 9: 215–295 (81 pages). Rafi Sharif Abad, J.; Khosravi, H.; Haidari Alamdarlou, E., (2014). Assessment the effects of land use changes on soil physicochemical properties in Jafarabad of Golestan province, Iran. Bulletin. Environ. Pharmacol. Life. Sci., 3(3): 296-300 (5 pages). Rasiah, V.; Florentine, S.K. ; Williams, B.L. ; Westbrooke, M.E., (2004). The impact of deforestation and pasture abandonment on soil properties in the wet tropics of Australia. Geoderma., 120: 35-45 (11 pages). Rezaei, N.; Roozitalab, M.H. ; Ramezanpour, H., (2012). Effect of land use change on soil properties and clay mineralogy of forest soils developed in the Caspian Sea region of Iran. J. Agr. Sci. Tech., 14: 1617-1624 (8 pages). Rodríguez, A.R. ; Arbelo, C.; Guerra, J.; Mora, J.; Notario, J.; Armas, C., (2006). Organic carbon stocks and soil erodibility in Canary Islands Andosols. Catena, 66(3): 228-235 (7 pages). Rodrigo-Comino, J.R.; Quiquerez, A.; Follain, S.; Raclot, D.; Le Bissonnais, Y.; Casalí, J., Giménez, R.; Cerdà, A.; Keesstra, S.D. ; Brevik, E.C. ; Pereira, P.; Senciales, J.M. ; Seeger, M.; Ruiz Sinoga, J.D. ; Ries, J.B, (2016). Soil erosion in sloping vineyards assessed by using botanical indicators and sediment collectors in the Ruwer-Mosel valley. Agric. Ecosyst. Environ., 233: 158-170 (13 pages). Romero, C.; Stroos nijder, L.; Baigorria, G., (2007). Interril and rill erodibility in the northern Andean Highlands. Catena., 70 (2): 105–113 (9 pages). Şeker, C., (1999). The effect of water content on the penetration resistance of different soils, and regression models. Turk. J. Agric. For., 23(2): 467-472 (6 pages). Shabani, F.; Kumar, L.; Esmaeili, A., (2014). Improvement to the prediction of the USLE K factor. Geomorphology., 204: 229-234 (6 pages). Singh, M.; Khera, K., (2009). Physical indicators of soil quality in relation to soil erodibility under different land uses. Arid. Land. Res. Manage., 23(2): 152-167 (16 pages). Song, Y.; Liu, L.; Yan, P.; Cao, T., (2005). A review of soil erodibility in water and wind erosion research. J. Geog. Sci., 15(2): 167-176 (10 pages). Szilassi, P.; Jordan, G.; Van Rompaey, A.; Csillag, G., (2006). Impacts of historical land use changes on erosion and agricultural soil properties in the Kali Basin at Lake Balaton, Hungary. Catena., 68(2): 96-108 (13 pages). Tanveer, M.; Anjum, S.A.; Hussain, S.; Cerdà, A.; Ashraf, U., (2017). Relay cropping as a sustainable approach: problems and opportunities for sustainable crop production. Environ. Sci. Pollut. Res. 1-16 (16 pages). Tejada, M.; Gonzalez, J.L., (2006). The relationships between erodibility and erosion in a soil treated with two organic amendments. Soil less Tillage Res., 91(1 –2): 186 –198 (13 pages). Turner, D.; Sumner, M., (1978). The influence of initial soil moisture content on field measured infiltration rates. Water SA., 4(1): 18-24 (7 pages). Vaezi, A.; Sadeghi, S.; Bahrami, H.; Mahdian, M., (2008). Modeling the USLE K-factor for calcareous soils in northwestern Iran. Geomorphology., 97(3): 414-423 (10 pages). Vaezi, A.; Bahrami, H.; Sadeghi, S.; Mahdian, M., (2010). Spatial variability of soil erodibility factor (K) of the USLE in North West of Iran. J. Agr. Sci. Tech., 12: 241-252 (12 pages). Walkley, A.; Black, I.A., (1934). An examination of the Degtjareff method for determining soil organic matter, and a proposed modification of the chromic acid titration method. Soil Sci., 37(1): 29-38 (10 pages). Wang, B.; Zheng, F.; Römkens, M. J.; Darboux, F., (2013). Soil erodibility for water erosion: A perspective and Chinese experiences. Geomorphology., 187: 1-10 (10 pages). Wischmeier, W.H. ; Smith, D.D., (1979). Predicting rainfall erosion losses-A guide to conservation planning. Predicting rainfall erosion losses-A guide to conservation plannin., 1-57 (57 pages). Zhang, K.; Li, S.; Peng, W.; Yu, B., (2004). Erodibility of agricultural soils on the Loess Plateau of China. Soil Tillage Res., 76(2): 157-165 (9 pages). Zhang, K.; Shu, A.; Xu, X.; Yang, Q.; Yu, B., (2008). Soil erodibility and its estimation for agricultural soils in China. J. Arid. Environ., 72(6): 1002-1011 (10 pages). Taleshian Jeloudar, F.; Ghajar Sepanlou, M.; Emadi, S.M., (2018). Impact of land use change on soil erodibility. Global J. Environ. Sci. Manage., 4(1): 59-70 (12 pages). GJESM Journal welcomes letters to the editor for the post-publication discussions and corrections which allows debate post publication on its site, through the Letters to Editor. 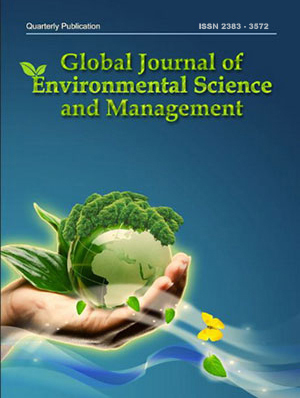 Letters pertaining to manuscript published in GJESM should be sent to the editorial office of GJESM within three months of either online publication or before printed publication, except for critiques of original research. Following points are to be considering before sending the letters (comments) to the editor. Letters that include statements of statistics, facts, research, or theories should include appropriate references, although more than three are discouraged. Letters that are personal attacks on an author rather than thoughtful criticism of the author’s ideas will not be considered for publication. Letters can be no more than 300 words in length. Letter writers should include a statement at the beginning of the letter stating that it is being submitted either for publication or not. Anonymous letters will not be considered. Letter writers must include their city and state of residence or work. Letters will be edited for clarity and length.